who coined the slogan “Hindi Chini Bhai Bhai”, but it certainly comes close to fitting the bill on this occasion. The Biryani, which came to India from other lands, has slowly but surely become the favourite dish in Kolkata. Whether it is Durga Puja, or Diwali, besides the known Biryani specialists, every corner of Kolkata appears to have a stall or shop and milling crowds. During the festivals, one could also see huge handis of biryani laid out in even the narrowest lanes, with pandal-hoppers crowding around waiting for a plate. Earlier, the best known outlet for biryani used to be The Royal Hotel located near the Jumma Masjid in Chitpur. Now there are a large number of restaurants known for their biryani. Among the most popular are Arsalan, Shiraz Golden Restaurant, Royal Indian Restaurant, Oudh 1590, Aminia, Bedwin and others. There are also newer outlets such as Krazy Biryani and the takeaway outlet Haan “D’ , launched very recently. 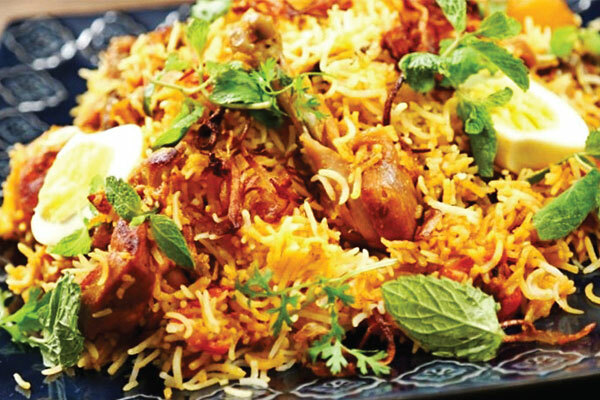 Biryani may never have reached Calcutta, if the British had not compelled Nawab Wajid Ali Shah, the 10th Nawab of Oudh and a descendent of the Mughals, to move to Calcutta. A poet and a lover of art and culture, Wajid Ali was perhaps considered too laid back to suit the British, who confiscated his treasury, his properties and land in 1856 and banished him from his beloved capital, Lucknow. Thanks to Nawab Wajid Ali Shah, Kolkata can now boast of a rather special type of biryani, probably created due to the shortage of funds. Feeding his retinue must have been a difficult task for the Nawab, whose allowance was meagre in comparison to the luxury he had been used to. But as far as the chief Khansama was concerned, there was absolutely no question of the Royal family not being able to eat their favourite mutton biryani! The ingenious chefs put their heads together and came up with an interesting solution. They decided to add large pieces of potato and full-boiled eggs to the mutton biryani, so that no one missed the fewer pieces of mutton. It was a hit with the Nawab and his family and soon became the only recipe used by his Bawarchis. Interestingly the Portuguese had brought potatoes to India not so long ago, and this comparatively rare new vegetable fitted in splendidly in making the biryani fit for the elite. And so was born a new biryani recipe created by the Nawab’s Royal Khansama, now known and relished simply as “Calcutta Biryani’.